CCIE certification which means Cisco Certified Internetwork Expert certification is one of the most prestigious and widely accepted networking certification. In fact, you can expect this certificate to be accepted worldwide. Networking professionals holding this certification can be instantly recognized for their skills and expertise about network engineering and other essential networking tasks and their extensive knowledge and background about all the products and solutions offered by Cisco. Most networking professionals who are part of the CCIE community are known for having already established an excellent reputation when it comes to leading the network industry through their extensive networking knowledge. In most cases, you can even expect these professionals to be deployed into networking tasks and assignments that are technically challenging. In order to become a CCIE certification holder, one needs to take and pass 2 distinct exams. The first one is a written qualification exam while the other one is the more challenging and difficult hands-on laboratory exam. The written exam usually covers vital networking concepts and equipment commands. Passing this will make you eligible for the scheduling of the laboratory exam which usually tests your skills, knowledge and ability in configuring actual equipment and troubleshooting the whole network within a timed situation. Fortunately, you now have greater chances of effectively handling all the pressures and challenges of the actual certification test for aspiring CCIE certification holders with the free CCIE practice course accessible at Brainmeasures which ultimately features the most extensive free study guide and comprehensive and accurate free practice test. The free CCIE certification practice course available at Brainmeasures is really your key towards generating an in-depth knowledge about the usual topics that you need to understand to reach your aim of becoming one of the most prominent, skilful and competent CCIE certification holders. This free practice course is really one of the most useful online certification courses offered by Brainmeasures for free since the accompanying free study guide works in explaining in full detail everything that you need to know about the field especially networking. With the proven extensiveness of this free study guide, you have greater chances of understanding how CCIE routing and switching is conducted, the different networking concepts starting from the simplest to the most complex ones, different commands that you can use in various networking equipment and the usual steps and procedures in correctly and effectively configuring and troubleshooting a network. The free practice test of this course also enables you to obtain a clearer background about what the actual certification exam really covers and how it is ultimately conducted so you will be guided once you take it. How Cisco offers recommendations regarding the design, implementation and maintenance of large networks? 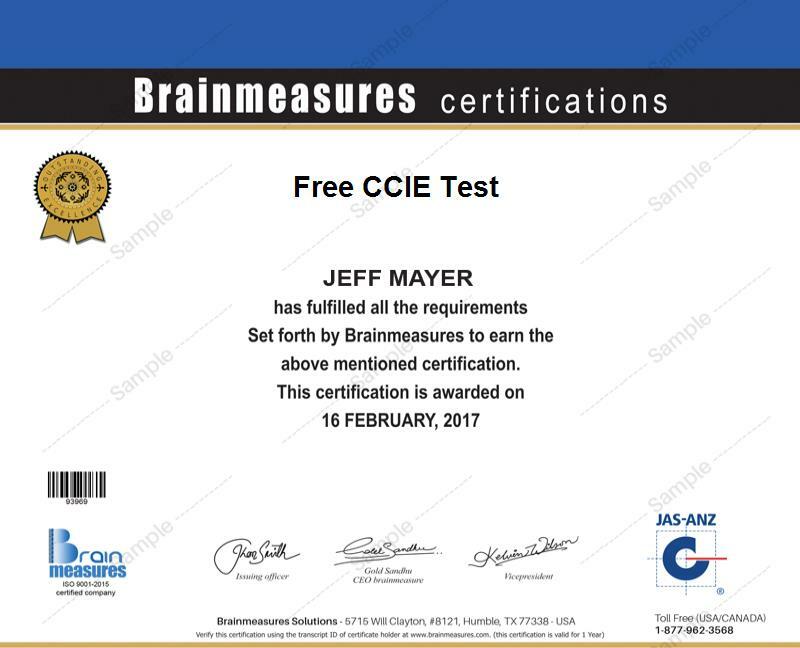 Nothing can beat the extensiveness of all the online certification courses that are now available at Brainmeasures including its free CCIE certification practice course. This free practice course actually targets those who have plans of becoming a CCIE certification holder by passing the related written and laboratory certification exams. The practice course can be expected to produce more benefits to all aspiring networking experts and professionals including network engineers, managers, consultants, analysts, technicians, administrators and specialists. A higher level of salary will also be in store for you as soon as you grab any of the jobs normally offered to CCIE certification holders. Working as a Cisco Certified Internetwork Expert (CCIE) will usually entitle you to enjoy a typical annual salary of around $70,000 to over a hundred thousand dollars. You can also grab the position of a CCIE routing and switching consultant which offers approximately $69,000 to $118,000 yearly.